We had no details but it just seemed ridiculous. There were probably around 6,000 there, we guessed and maybe just a few hundred German fans. True, the Hannover Ultras were known to be a dangerous lot but just a few hundred at a friendly game, surely they were controllable. We beat them in two world wars but at a small football match, apparently not. We finished the steaks and went on to the puddings. Burnley seemed a couple of thousand miles away and an abandoned football match seemed trivial in these opulent, lavish surroundings. 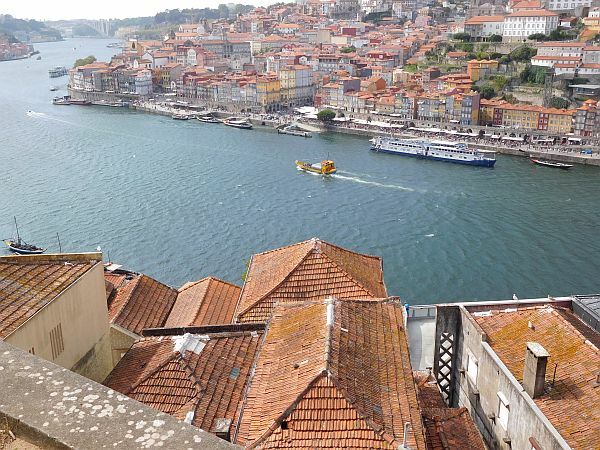 Besides there was a mission the next day, and that was to find and sample the famed Portuguese custard tarts of which I had seen and read so much in the holiday blurb and guide books. An optional walking tour of the city was called ‘A taste of Lisbon,’ but regretfully we chose not to do it. We took a broader tour of the city, a city with a stunning setting at the mouth of the River Tagus, a city that spawned countless sixteenth century seafaring explorers, Magellan, Vasco da Gama, amongst them and inspired by Prince Henry the Navigator. Not for nothing was it called the Age of Discovery. The Portuguese back then plundered Brazil and built an empire. I can remember at school reading and learning about these great names and their great stories. I suspect most kids today wouldn’t have a clue who they were. This is a historical city of monuments, churches, shrines, cathedrals, monasteries, museums, labyrinthine streets, tree-lined avenues, café bars and restaurants, and of course the original bakery where the famed egg tarts (pastel de nata) are made. Street foods like the Prego, a garlic steak sandwich, aren’t bad either. The egg tart has a long history and was first made by the monks of Jeronimos Monastery in the Belem area of the city, although they cribbed the recipe from France. Egg whites were used for starching clothes and this left the yolks which were then used in baking. When the monastery was closed in 1834 the recipe for the tarts was passed to the owners of the local sugar refinery. In 1837 they opened the Fabrica de Pasteis de Belem, still run by the descendants of the original owners. This café is on the tourist route, these are tarts that are made in many bakeries (in fact you can get them in Sainsbury’s) but the Belem bakery is the place to get them and the queues frequently stretch down the road. As our coach drove slowly by without a stop, yep, there were the queues and I looked longingly at the lines of tarts laid out in the shop window. I would indeed eventually get to taste one in another café. Trust me these are egg tarts to die for. Conveniently packed in boxes of six they were on sale in the airport on the way home, ready for slipping into the carry-on bags. Needless to say one box flew back with us and when the last one was eaten a couple of days later, it brought a symbolic closure to a marvellous holiday. And then it was on to baroque Porto, Portugal’s second largest city, a city built on Port with over 50 wine companies along the river bank. Look on supermarket shelves at the Port and it’s a fair bet that most came from the Douro region. All the familiar names were there, Fonseca, Graham’s, Sandeman’s, Dow’s, Taylor’s. Porto straddles the River Douro, the river that has carved out a deep and steep-sided 200-hundred mile long gouge in the Portuguese landscape. These are the hillsides that are covered in terraces of vines, thousands of acres of them and where the great wine estates are located. Porto too is built on steep slopes that rise from the river, the river spanned by towering, graceful bridges, another city of churches, cathedrals, markets, castles, narrow cobbled streets and quaint wooden trams that rattle and clang up and down the streets. Our boat ‘The Viking Hemmings’ was moored up more or less opposite the Sandeman’s port warehouse, the great barrels and casks filling the huge, cool storerooms. The Hemmings was our home for the next seven days, the final day being the day of the Chelsea game. The sun, wine, food and slow cruise back down the river on the day would be ample consolation for the inevitable defeat, and in the meantime there was so much to enjoy on this floating food-fest. Make no mistake; a holiday with Viking River Cruises puts you at serious risk of weight increase. You don’t ask, where is the lifeboat; you ask, where is the defibrillator? The day starts with a huge buffet breakfast with the chef standing at the end of the dining room at the ‘egg station’ ready to cook any egg dish of your choice. Onto to that you can pile anything else that fills the buffet. ‘I will not be eating huge lunches,’ I vowed before we boarded. But when lunch is served it cannot be disregarded; it would be rude and disrespectful and these were three-course affairs that could not be ignored. And then in the evening there was dinner, another lavish three course event and as at lunch, as much wine as you could glug. And all the while through breakfast and lunch the boat sailed serenely along the Douro with views of the terraces, estates and quintas, solitary farmhouses, tiny chapels, isolated cottages, narrow gorges, olive groves, almond trees, an occasional worker, fish jumping out of the water, and above us the soaring eagles and vultures. In years past the river was bedevilled by rapids that the little rabelo boats carrying the port barrels down to the warehouses for ageing and storage, had to negotiate at their peril. Today, huge dams with locks for the boats, plus widening of certain stretches, have tamed the river. It was the first day of sailing on the river and we’d stopped at Regua after lunch ready for a tour, nay pilgrimage, to a place that most rose wine drinkers would recognise from the picture on the iconic round bottle. It was a drink that we had back in the 70s in those legendary Berni Inns where we had a prawn cocktail, a steak, and a pudding, and whenever we went, a bottle of Mateus Rose. Back then if you wanted to eat out there wasn’t much to choose from and Berni Inns were in the forefront of Friday or Saturday night treats. 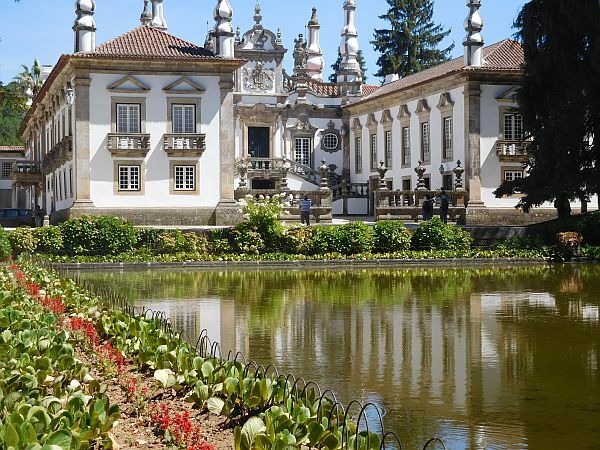 We used to look at the picture on the bottle of the Mateus Palace and think what a wonderful place it looked, without even really registering that this gorgeous building was in Portugal. It was therefore with an almost sense of reverence that we headed off on the one hour journey to get there, a wonderful drive through the wine areas and vineyards along highways that hugged the dizzying hillsides, clung to the steep contours, and then traversed the deep valleys and gorges via the most spectacular, awesome bridges, with the valley floor hundreds of feet below.